The 2018 Workforce Needs Assessment survey has closed. The data below will be updated with the survey results in early 2019. The Workforce Needs Assessment Survey is an annual employer survey conducted by Iowa Workforce Development. Employers are asked to provide information regarding both their current level of employment and their current and expected job vacancies. The goal of the survey is to collect data regarding the demand for workers and the skills required of workers, both statewide and regionally. 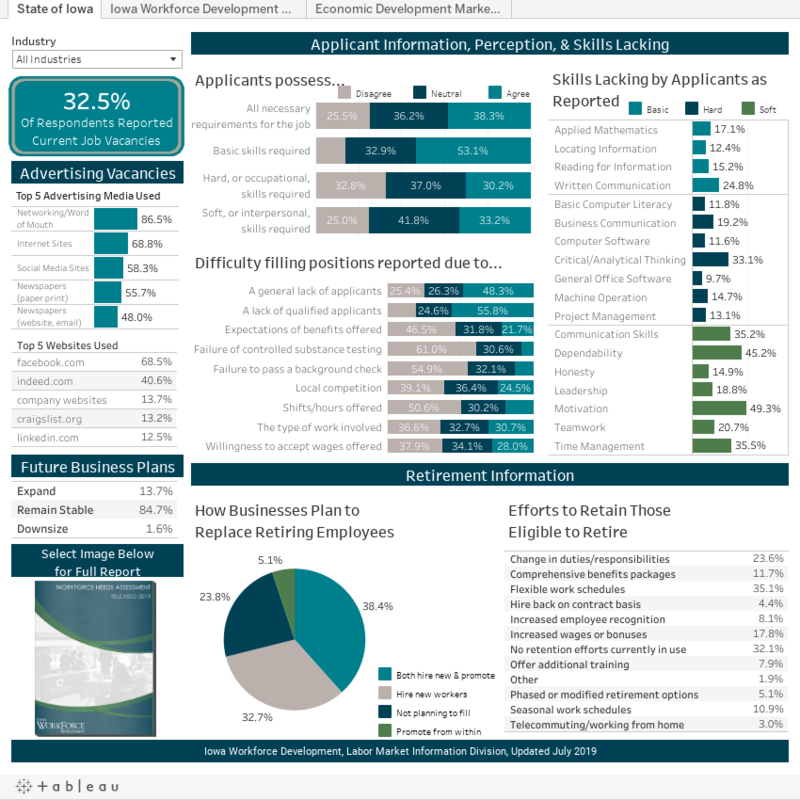 This information can be used by economic developers, government officials, employers and educational administrators to guide their decisions on issues related to workforce development, training and employee recruitment programs. Current data can be viewed and explored in the Tableau visualization below. Navigate the various visualizations by using the three tabs at the top of the frame. To customize the view, select the industry from the filter at the top left. The data is also available in a series of PDF files located at the bottom of this page. Note: Due to data suppression and confidentiality issues information may not be available for every industry within each region. Select a year from the drop-down menu below. Select a county from one of the drop-down menus below to view its regional Workforce Needs Assessment report. If you need help determining which regional report you want to view click here for area definitions.